Diagnostic Imaging, or Radiology, involves the use of various imaging modalities to view the internal structure of the human body. 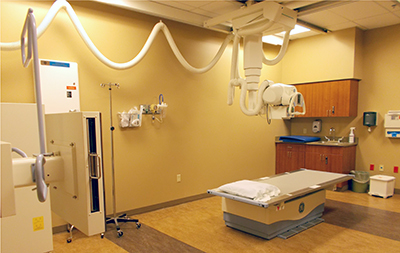 Scott County Hospital is equipped with the most modern and effective diagnostic imaging technology available today. Our knowledgeable technologists perform diagnostic testing with personal care and attention, taking time to explain each procedure so you'll know what to anticipate every step of the way. We offer a wide range of radiology services including routine diagnostic X-rays, fluoroscopy, ultrasound, computed tomography (CAT scan), magnetic resonance imaging (MRI), Mammography, bone densitometry, and Nuclear Medicine. Physician referrals are required for all Diagnostic Imaging examinations, except mammography. We look forward to serving you for all your Diagnostic Imaging examinations. Nuclear Medicine involves the use of small amounts of radioactive materials/tracers to help diagnose and treat different diseases. Nuclear Medicine exams help to determine the cause of the medical problem based on the function of the organ, tissue or bone. The other modalities within Imaging (ultrasound, CT, MRI, diagnostic x-rays) help determine the presence of disease based on the structural appearance. Patients receive an extremely small amount of a radiopharmaceutical, just enough to provide sufficient diagnostic information. The amount of radiation from a Nuclear Medicine procedure is comparable and sometimes less than that of a diagnostic x-ray.